Softened by a round-edged silhouette, this elegant contemporary version of the shelter frame sofa epitomizes refinement. The Centennial sofa is a contemporary take on the shelter frame sofa. Its elegant, round-edged silhouette atop a modern frame is available in two fabric upholstery options. The slightly inclined backrest and armrests exude refined elegance. Offered in velvet or fabric, the tufted-style Centennial sofa comes with a choice of two decorative cushions. 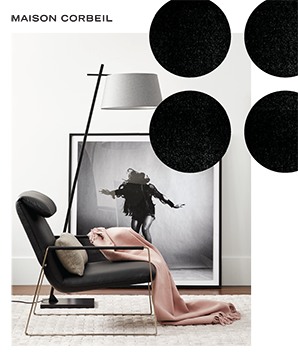 Inspired by the mid-century aesthetic, its base and silhouette pairing are noteworthy. The high base, in antique brass or brushed steel, is distinctly modern, while the silhouette retains a softened appeal thanks to its rounded edges. - Modern silhouette with rounded edges. - Choice of upholstery and assorted cushions. - Inclined backrest and armrests. - High and modern frame.